I’ve been enamored of developing simpler stir fry recipes that are based upon the principles of Cantonese cuisine: ingredients combined to create a flavor/color/texture contrast with minimal use of condiments so as to allow the natural flavors of the food to shine through. I never really loved Cantonese cuisine when I was younger, probably because I had only eaten wretchedly greasy, relatively flavorless, gloppy versions of it at bad restaurants. And let me tell you, the versions of Cantonese food I ate as a young adult are a far cry from being accurate representations of the cuisine! But as I have aged, I have found myself drawn to the aesthetics of the Cantonese ways with food. I think it is because I grew up eating very simple food. My grandmothers prepared vegetables, in particular, simply–with only a bit of butter, (or, bacon grease!) salt and pepper and sometimes an onion or some vinegar. Now, granted, to my taste now, they overcooked their vegetables woefully, but they still tasted good–and like themselves, though admittedly, like overcooked versions of themselves. But still delicious. Meat was prepared in much the same way–maybe some onions, a bay leaf, salt and pepper, sometimes garlic–and that was generally it. And particularly when it was the grass-fed beef my mother’s parents raised–the meat tasted like the very essence of itself. And that is the challenge of cooking simple food. You must let the natural flavors shine through without making the food taste bland and lacking in depth. Part of the trick of this is to start out with the best ingredients you can get your hands on, and then don’t overcook or undercook them, and for goodness sake, be judicious in the use of your aromatics, spices and condiments. So, that’s what I’ve been up to these days, when I haven’t been busily sewing Generic Winter Holiday presents. (That’s why no recent posts–been stitching, by hand and machine–oh, and moving a friend from a nightmare house into a nice house. That took a day…) I’ve been coming up with new and simpler ways to stir-fry fairly ordinary seasonal ingredients and transform them into the very essence of themselves. And this recipe, like the Baby Gai Lan with Chicken and Chilies, is a good example of this process at work. 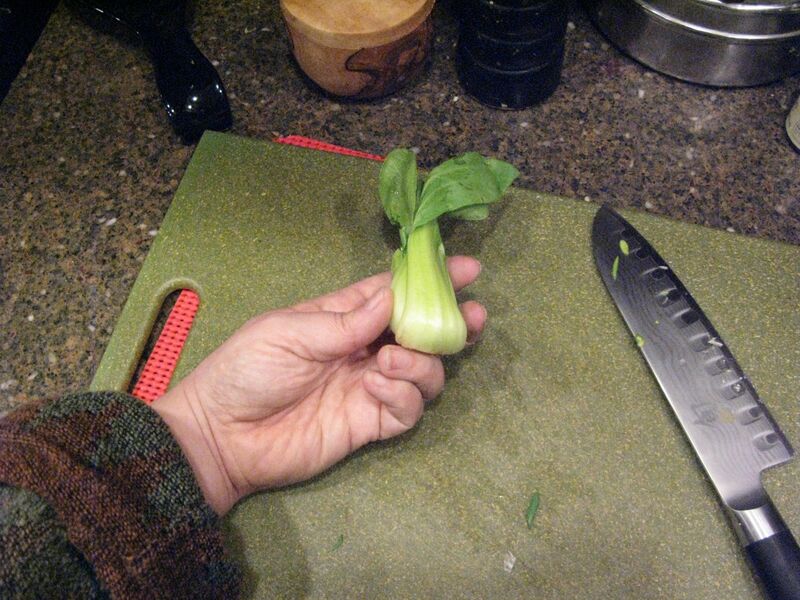 Oh, one more thing before we go on to the recipe, let’s talk about how to cut baby bok choy in half without having them fall sadly apart. See how pretty they look in the photo above? Well, they aren’t only pretty–they cook faster and more evenly in a wok if you cut them longitudinally. But, as I said, you have to cut them the correct way, or they just might fall apart on you and they also won’t be as lovely looking as my examples. 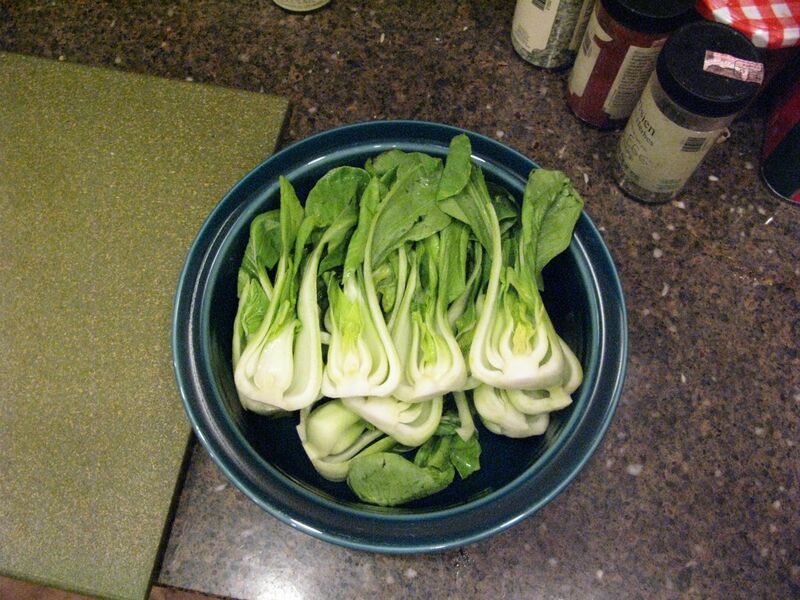 Okay, take a look at the bok choy in this photograph. I call the side that is up the “back” of the vegetable. 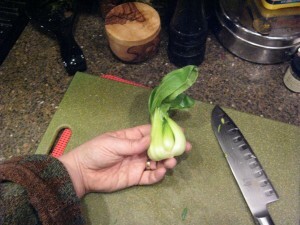 And it is through the back that you want to cut the bok choy. If you turn the vegetable a quarter turn to the right or left–it doesn’t matter which–you will see that instead of a solid broad stem and leaf, that you are looking into the layers of the bok choy. I call that the front, and that is where you do NOT want to cut. So, just cut through the “back” of the bok choy where you see a single broad stem and leaf, instead of through the “front” which shows the layers of the leaves. You get a prettier result that is less likely to fall apart on you. How does this taste? Well, Kat loved it, as did Zak. I cooked it again tonight for Kat, Zak, Morganna and Brittney and the two line cooks loved it too. It is sweet, but not cloyingly so–just sweet enough to enhance the natural sweetness of the pork. The bok choy tastes green and fresh without being bitter and the mushrooms are like velvet–they all but melt in your mouth. Toss pork with the first measures of soy sauce, mirin and honey, as well as the cornstarch. Allow to marinated for twenty minutes–which is about the amount of time it will take you to prepare the other ingredients. Heat your wok over high heat until a thin thread of smoke spirals up from the surface. Add the canola oil and heat it until it shimmers–which should take about another thirty seconds or so. Toss in the scallions and cook, stirring constantly, for one minute. Add the mushrooms and stir fry until the scallions take on a golden color. Scrape the pork into the wok and arrange it into as close as a single layer as you can manage. Sprinkle with the garlic, ginger and the second measure of honey, then allow the pork to cook, undisturbed in the bottom of the wok, until it browns on that side. Then, start stir-frying again, and when it is nearly all white and brown and most of the pink is gone, deglaze the wok with the second measures of soy sauce and mirin. Add the bok choy immediately, and cook, stirring until it browns a bit and wilts slightly, and the pork is done, and a small amount of very thick brown sauce lightly glazes the ingredients. Remove the wok from the heat and drizzle in the sesame oil and stir to combine it well. Serve with steamed rice–it is enough to feed two adults and one toddler. You can double this recipe, but if you do, either cook it in two batches, or cook the meat first, remove it from the wok and then cook the bok choy and bring everything together at the end with the second measures of mirin and soy sauce. Happy Holidays Barbara to you and your family. 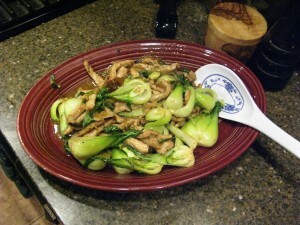 Awesome recipe, I always screw up and cook the crap outta the baby bok choy. Nothing wors(er) than an uncrunchy bok choy. Very interesting cutting method that I’ve never heard of. Cool. Starving now thanks to you Barbara! Great recipe but I think is definitely too complex for me. I guess I have to start with something much easier and for now just read about meals like this one. Is this an Asian recipe? It looks like one. I bet this one is delicious. Thank you! Now that they actually have baby bok choy (and gai lan, etc) at our grocery store, I am excited to try this out!! Happy New Year to you all! Barbara, I am wickedly happy to see you back! Looks like a yummy recipe and Baby Bok Choy was at the farmers market last week, here is hoping I can get some this week! Hi Barbara, I am glad to see you back as well! Do you have a facebook page for your blog? You haven’t posted for ages. Is everything ok? Hey Barbara, I’m hoping that you’re busy enjoying life and that’s why you haven’t been posting. Thinking of you! I too hope you are not posting because you are doing wonderful and joyful things. I hope you are all right and nothing is wrong. Made this for myself month’s ago. It really is easy and I love how you’ve timed it so that when the pork is marinating, you prep the rest of the ingredients. That kind of thoughtful preparation to timing is what makes your website my go to place for recipes. That and the delicious results that nail it. I’m making this for my sister tonight (who only deserves the best) and I can’t wait to prepare this dish and also for the expression on her face when she takes the firs bite. Thank you Barbara for T&S.